RSVPMaker now includes its own support for online payments via the Stripe service, including a new Gutenberg block for defining payment buttons to be embedded in a page or post. This means you can use the same online payments mechanism for event payments and other sorts of payments, such as donations, consulting fees, or membership dues. This capability was created partly to support the WordPress for Toastmasters project, which uses RSVPMaker for event scheduling, and includes a “dues schedule” option for fees that are prorated depending on the month when someone joins. The example shown above is from Online Presenters Toastmasters, where online dues payments are particularly important since the club has no physical meeting space. Previously, RSVPMaker offered an integration with the WP Simple Pay for Stripe plugin, which is still supported (and may make sense if you use it for other purposes). However, if you use RSVPMaker’s built-in support for Stripe, you should deactivate WP Simple Pay to prevent conflicts. Here is an outline of how it works. 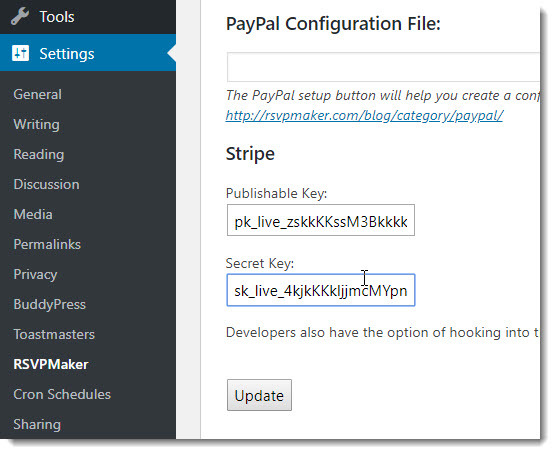 After creating an account with Stripe, you will need to obtain two key codes from that service and enter them in RSVPMaker. 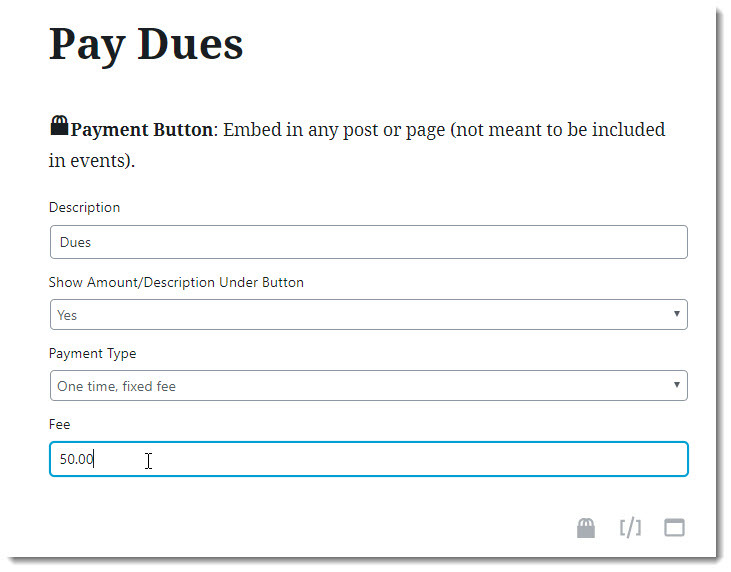 To use RSVPMaker’s stripe integration outside of an event, look for the Stripe Charge block in the WordPress editor. Enter the payment parameters into the Stripe Charge block. The block is rendered on the front end of the website as a “Pay with Card” button. In addition to recording a single payment, the Stripe payment button can be configured to record a subscription payment, meaning the user will be billed again after a set period. The supported intervals so far are monthly, yearly, and every six months. This functionality is all brand new, so if it doesn’t work correctly, let me know.